Yo guys! Thomas from The Corner wrote to inform us about the Independent Music Showcase & Industry Conference at The Back Room from April 7th - 9th. Man crazy... looks like there's going to be some BIG names... Mike Jones, Paul Wall, Bun B, etc. You can get tix here and more info here. 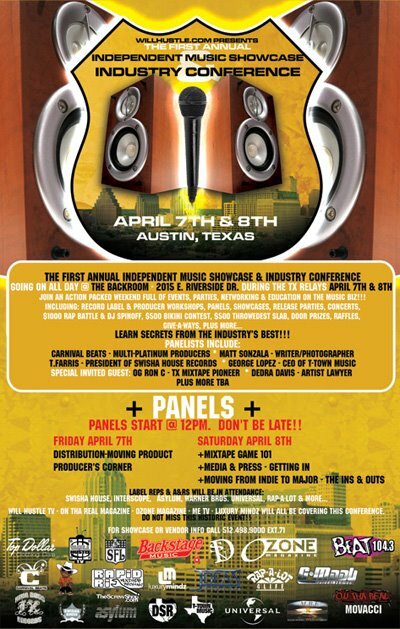 "The First Annual Texas Independent Music Showcase & Industry Conference will coincide with the Texas Relays – one of the biggest annual Black College events in Texas – in Austin, Texas from April 7th – 9th, 2006. The event will be held at The Back Room (2015 E. Riverside), Austin’s premier venue for hip-hop and rap events. 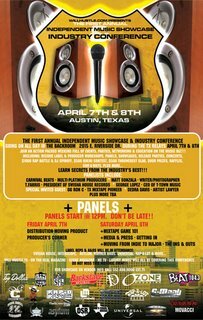 Please join us for an action packed weekend full of parties, networking, panels, concerts and music business education. Tickets will be available at WillHustle.com and The Back Room Box Office, beginning April 1st."